The Disney brand may conjure up images of cartoon mice and kid’s movies, but adventure stories were a large part of the company’s output in the 1950s and 1960s. Earlier releases in the Disney Treasures DVD series have featured Davy Crockett, the Swamp Fox (Revolutionary War hero Francis Marion) and Elfego Baca (a 19th century New Mexico lawman). 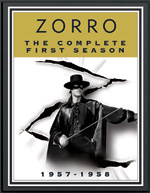 This year, Walt Disney Treasures releases the complete Zorro, a Disney television series that ran from 1957 through 1959. Zorro (aka Don Diego de la Vega) was created by pulp fiction writer Johnston McCulley in 1919. This masked crusader for justice appeared several times on the big screen before the Disney company brought him to television. The show aired for two seasons until a legal battle between Disney and ABC put an end the series. In all, 78 episodes, at about 25 minutes each, were made. Another four 50-minute episodes were produced for Disney’s anthology show. It’s all on two new DVD sets with a few bonus features as well. It’s 1820. Los Angeles is a sleepy port town in a backwater of the Spanish empire. Don Diego de la Vega (the suave Guy Williams) is returning from Spain after receiving a troubling letter from his father. All is not well in Spanish California. The commandante in Los Angeles is demanding high taxes. Decent, law-abiding citizens are hauled off to prison for speaking out against the government. Priests are being bullied and Indians are being enslaved. Every episode leads up to an action sequence or two. Zorro gets many opportunities to show off his fencing prowess. Thankfully, the camera stays back and captures the action without too much cutting (according to a bonus feature, it took up to five hours to film a sword fight). When the sword isn’t convenient, Zorro pulls out his whip. When all else fails he, or his alter ego, uses his wits. The rotund Sgt. Garcia (Henry Calvin) is easy to fool. The succession of bad guys and banditos are more clever. The scripts don’t set Zorro apart, but the production values do. In addition to the swordplay, there are plenty of chase scenes involving horses and carriages. The outdoor shooting locations, sometimes enhanced by matte paintings, give the episodes a true western feel. When there is no need for plot or action, there are musical or dance interludes. It’s a lot to pack into a 25-minute episode, and it keeps the show fun. Both six-disc sets come in black tins and include a certificate of authenticity, a publicity still of Guy Williams in costume, and a Zorro pin. The first disc of each set has an introduction by Leonard Maltin, who gives a little background on the series. The Season One set has two complete episodes of Disney’s weekly anthology show from 1960, featuring 50-minute Zorro adventures. The Season Two set has two more 50-minute episodes from 1961. Also in the first season set is a three-minute excerpt from the anthology show, which has Walt Disney talking to the Mouseketeers about Zorro. The Life and Legend of Zorro (12 minutes) starts with a brief history of the character and then focuses mainly on the production of the television series. On the second season set is Behind the Mask (8 minutes), about Guy Williams. It includes interviews with Guy Williams Jr. and Buddy Van Horn, who did stunts for Williams. In A Trip to the Archives (8 minutes), Maltin and Williams Jr. look at some old Zorro costumes and memorabilia. The picture is in the original black and white with a 1.33:1 aspect ratio. The sound is 2-channel Dolby mono. Viewing these discs will give the audience the experience of watching 1950s television without the degradation of quality that can happen after 50 years. Watch one or two episodes at a time. Check out the bonus features when you get to disc six.